www.typingagent.com■ Retail Price: Tiered pricing structure based on FTE: $0.80-$7 per student. Typing Agent is a fully Web-based program that allows central teacher control over student typing lessons and test curriculum. The school and district dashboard allows the teachers and administrators to set curriculum, goals, and lessons for individual students, whole classes, and grade levels. Additionally, Typing Agent offers basic coding lessons for students in 3rd grade and up, an opportunity for student-teacher communication via “Spy Mail,” the ability to turn on a completely walled social network called Agentbook to teach Internet safety, and an array of games for each grade level. Quality and Effectiveness: Perhaps the most powerful feature of Typing Agent is the centralized dashboard where you can track student progress and growth. The use of student, class, grade, and district level progress reports allows districts to track student progress over time and ensure that everyone is on track to meet end-of-year goals. The additional practice available via games and challenges adds a new dimension to typing instruction. Curriculum is available for students in grades K-12 and each grade level grouping has a slightly different, spiraling curriculum, which can also be customized by the teacher. Ease of Use: Because Typing Agent is Web-based, there is no software to install and the program works on all platforms. Navigation is standard across all platforms, and clearly labeled for all users. There is a separate interface that is easier to use for K-2 students. The teacher help section provides text-based answers to most frequently asked questions, and the option to submit questions that are unanswered. Students and teachers can be loaded quickly and easily to Typing Agent using a CSV file or by self-registration. Typing Agent also offers Single Sign On capability with Google and Clever. Creative Use of Technology: The district admin module allows for tracking of an entire school district. Typing Agent employs proprietary software called typeSMART, which automatically adapts instruction and targets areas where students are weak, focuses on quality over quantity, assigns a Q-Score, and offers alerts, course mapping and progress reports. typeSMART also alerts a teacher if unusual typing behavior is noted (for example, if a student types much faster at home than at school). The use of a spiraling curriculum helps ensure that students are getting maximum exposure to keyboarding. Students are able to earn Agent rankings, similar to badges in other gaming platforms. Typing Agent also allows for parent access to the student’s progress in the program. Finally, the pre-loaded content used in the typing tests is a mix of current events and curricular content, which means that students are reinforcing other knowledge while practicing their typing skills. Typing Agent also offers automatic grading, based on criteria set by teachers for accuracy and speed. Suitability for Use in a School Environment: The curriculum is ready to go as is, but also fully customizable. As the grade levels increase, the difficulty of the vocabulary in the program increases as well. Curriculum is provided for all students, grades K-12. The addition of the new coding modules only adds to its usability in teaching 21st-century skills. 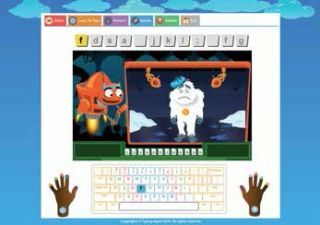 Typing Agent is an easy-to-use program that will capture students’ attention and encourage them to practice their typing skills outside of the classroom. • Accountability: Typing Agent tracks student progress individually, by class, by grade, and over the entire district. • Customizability: Typing Agent offers the ability to customize curriculum based on needs and goals of the teachers and districts. • Engaging: The use of games will encourage students to increase practice time.